It rained last night, something you don't expect 1600m up in the Alps in January, it's just not cricket. The humidity had successfully turned the crisp, crunchy access road into a skating rink with a gradient. My midnight stroll back from Le Diamant Noir was quite a challenge over the laws of physics. Matters hadn't improved this morning, Carl struggled to gain sufficient traction to make it off the access ramp to the apartment. Eager to "seize the day" Carl, Andy and I made it onto the 3rd chairlift to put in some fresh tracks on our warm up run down the Grands Vans. In such freeze / thaw conditions it was hard and icy in places. Next we headed up the DMC cable car to the top station at 2500m to see how conditions fared at altitude. As you might expect, they were better, with lots of heavy buttery snow. We had to make our pre-arranged rendezvous with Ric Platt above Les Carroz. It would seem that organising skibikers is much herding cats! We were late and Ric had managed to get himself lost, thank Nokia for mobile communications. 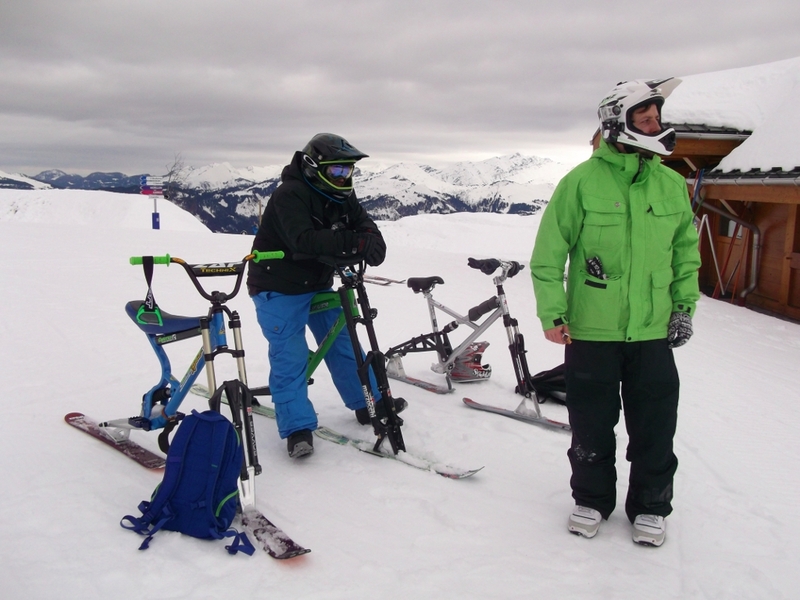 Ric Platt, is very much "Old Skool" and has been skibiking since the early 1970s, so has seen the heydays, then the period when skibikes were banned throughout France, to now witness a re-emergence of skibiking. He has resisted abandoning traditional footskis and heading into the brave new world of freestyle skibiking, he intends to continue skibike riding indefinitely and eagerly anticipates the generous lift pass discounts available to the over 75s! Having located Richard, we returned to Flaine for a succession of loops up the DMC cable car and back down again. The brilliant Mephisto Superieur "monster" run was now running even better than earlier. 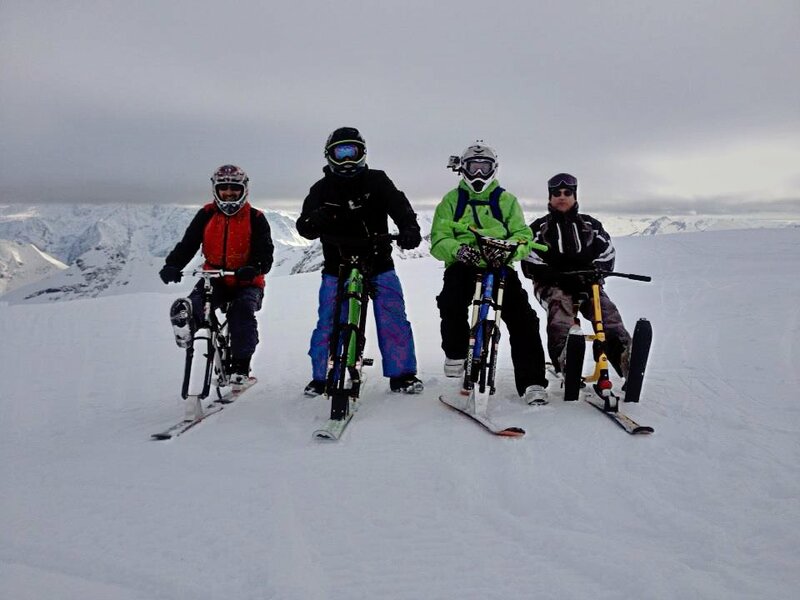 A fine afternoon of skibiking was had, including some enjoyable off piste excursions. Towards the end of the afternoon we headed back towards the links with Morillon and enjoyed a fine Vin Chaud before heading our separate ways. The day concluded with a few sublime runs in soft, slow snow, hell for the tired skiers heading for home, but heaven for the feisty skibikers.